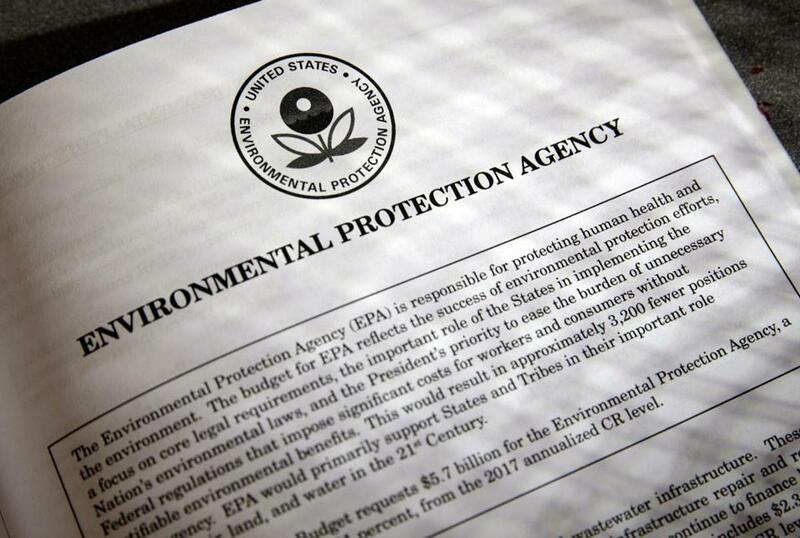 Proposals for the Environmental Protection Agency (EPA) in President Trump&apos;s first budget. WASHINGTON — Moving forward with a campaign pledge to unravel former President Obama’s sweeping plan to curb global warming, President Trump will sign an executive order Tuesday that will suspend, rescind, or flag for review more than a half-dozen measures in an effort to boost domestic energy production in the form of fossil fuels. Trump, who has called global warming a ‘‘hoax’’ invented by the Chinese, has repeatedly criticized the power-plant rule and others as an attack on American workers and the struggling US coal industry. The contents of the order were outlined to reporters in a sometimes tense briefing with a senior White House official, whom aides insisted speak without attribution, despite President Trump’s criticism of the use of unnamed sources. The Obama administration had imposed a three-year moratorium on new federal coal leases in January 2016, arguing that the $1 billion-per-year program must be modernized to ensure a fair financial return to taxpayers and address climate change. The order will also chip away at other regulations, including scrapping language on the ‘‘social cost’’ of greenhouse gases. It will initiate a review of efforts to reduce the emission of methane in oil and natural gas production as well as a Bureau of Land Management hydraulic fracturing rule, to determine whether those reflect the president’s policy priorities. The administration is still in discussion about whether it intends to withdraw from the Paris Agreement on climate change. But the moves to be announced Tuesday will undoubtedly make it more difficult for the US to achieve its goals. Opponents say the plan will kill coal-mining jobs and drive up electricity costs. The Obama administration, some Democratic-led states and environmental groups countered that it will spur thousands of clean-energy jobs and help the US meet ambitious goals to reduce carbon pollution set by the international agreement signed in Paris. Trump’s order on coal-fired power plants follows an executive order he signed last month mandating a review of an Obama-era rule aimed at protecting small streams and wetlands from development and pollution. The order instructs the EPA and Army Corps of Engineers to review a rule that redefined ‘‘waters of the United States’’ protected under the Clean Water Act to include smaller creeks and wetlands. While Republicans have blamed Obama-era environmental regulations for the loss of coal jobs, federal data shows that US mines have been shedding jobs for decades under presidents from both parties as a result of increasing automation and competition from cheaper natural gas. Another factor is the plummeting cost of solar panels and wind turbines, which now can produce emissions-free electricity cheaper than burning coal. According to an Energy Department analysis released in January, coal mining now accounts for fewer than 70,000 US jobs. By contrast, renewable energy — including wind, solar and biofuels — now accounts for more than 650,000 US jobs. ‘‘These executive actions are a welcome departure from the previous administration’s strategy of making energy more expensive through costly, job-killing regulations that choked our economy,’’ he said. ‘‘This is not just dangerous; it’s embarrassing to us and our businesses on a global scale to be dismissing opportunities for new technologies, economic growth, and US leadership,’’ she said in a statement.